The invention of the slide rule is usually credited to William Oughtred in the 1620s. Previously, lines with numbers marked out logarithmically had been used with dividers to carry out multiplications, but having two scales sliding together was far more convenient. Oughtred introduced both circular and linear slide rules, but it was only at the end of the nineteenth century that they became really popular. For engineering calculations, where 'safety factors' are often applied, the limited accuracy of a slide rule is not a major drawback. Enrico Fermi is said to have used his slide rule to keep track of neutron fluxes as the first ever nuclear reactor went critical. This American-made slide rule is twice the most common length, allowing calculations to more significant figures for more detailed problems. It also has a less common scale arrangement, where the usual A and B scales that allow squares and square roots to be found easily, are replaced by 'π- folded' CF and DF scales.These are the same as the C and D scales but translated to allow easy multiplication and division by π as often required in calculations involving circular motion and oscillations and waves. 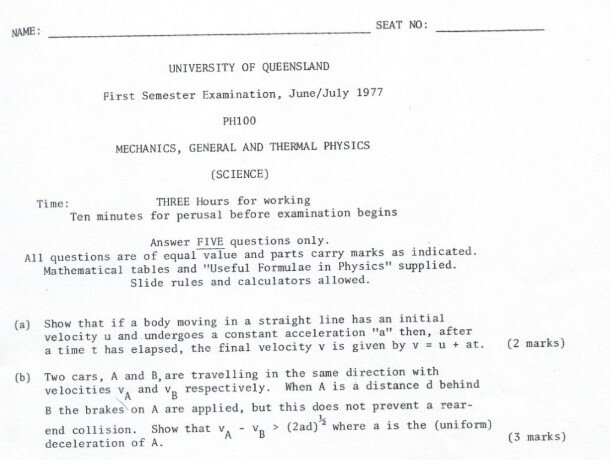 It belonged to UQ Physics staff member Dr W. Lasich.